This is a great Christmas Present for the musician in your life. you can be sure they don't have one or anything like it (it is one of a kind) and it is glamorous enough for everyone. This is one Fantastic Guitar! Serial #000 Only 500 of these guitars were made. 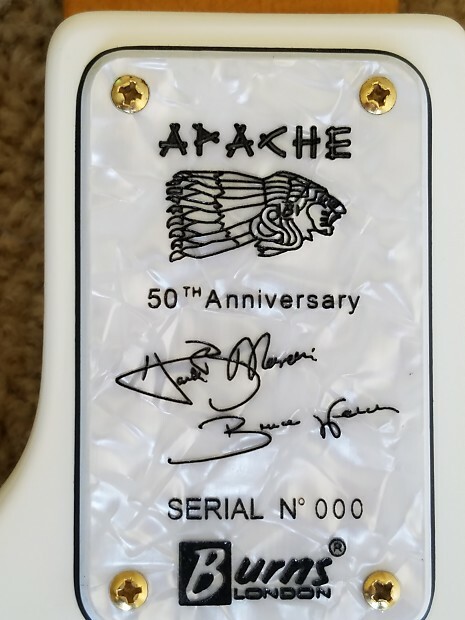 It is the prototype for the Burns Apache. 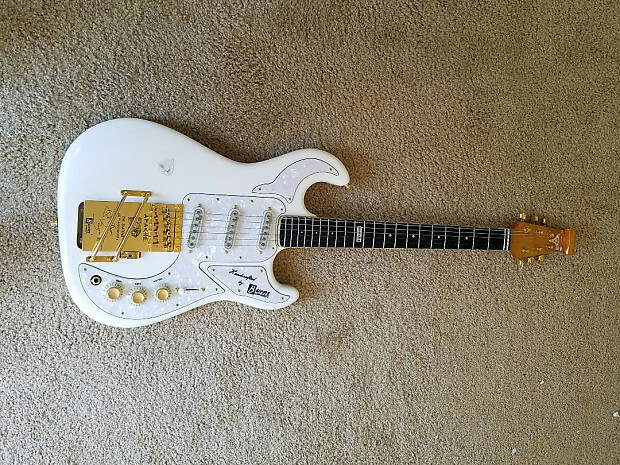 It is mint condition , from the NAMM Show totally one of a kind. The beautiful maple-rosewood neck is bound with mother of pearl binding. Inlayed Gold Sperzel Locking gears, the best and not on subsequent editions of the guitar. 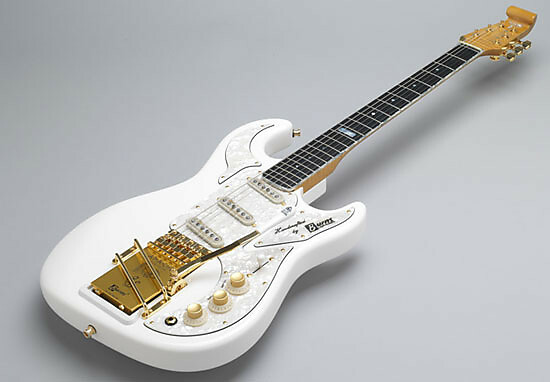 A gold Hank Marvin Shadows vibrato with engraved signatures. “Handcrafted by Burns” Unique Burns Custom multi-piece pickguard. The neck has the Burns unique geared truss rod for very easy adjustment over a very wide range. it also has a tilt neck adjustment to zero in exactly the action you want. 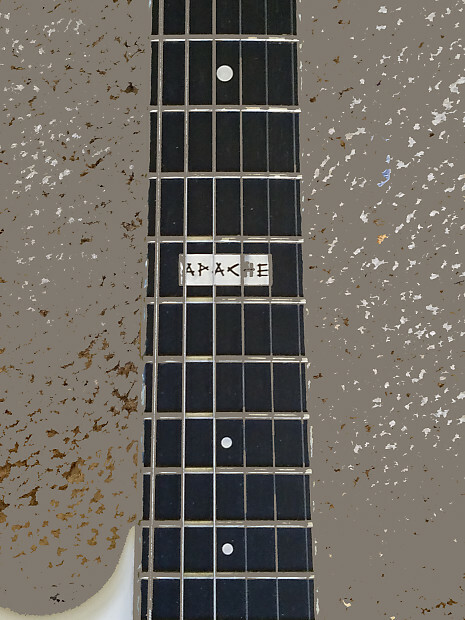 The neck has a zero fret, a first/first fret that guarantees perfect action and intonation. Electronics are the best quality, volume and two tone controls. With the special push-pull pot burns boost in the wiring setup. Great strat tone with no buzz. There is a gold bar across the vibrato for you to rest your hand on and not make the guitar go out of tune. * Snakeskin deluxe padded Hardshell case. * I've included a Copy of the "Burns Book" history of Burns guitars. The instrumental Hit "Apache" was written by Jerry Lordan and recorded by Hank Marvin and the Shadows in the U.K. their biggest hit. BUT the Danish guitarist Jorgen Ingmann had the U.S. hit due to low market penetration by the shadows in the U.S. and a dubious lawsuit from another band named the Shadows. Apache has been recorded by most all Surf type instrumental bands, and by the Ventures (prior to the Surf Thing) You can hear it EVERYDAY on a current TV commercial!